Drop dough by slightly rounded tablespoons 2 inches apart on ungreased cookie sheet. Bake 8 to 10 minutes or until edges are set. Cool 1 minute; remove from cookie sheet to cooling rack. Meanwhile, in small bowl, mix peanut butter, powdered sugar and vanilla until well blended. Spread about 1 teaspoon mixture on top center of each cooled cookie. In small microwavable bowl, microwave chocolate chips and cream uncovered on High 30 to 45 seconds; stir until smooth. 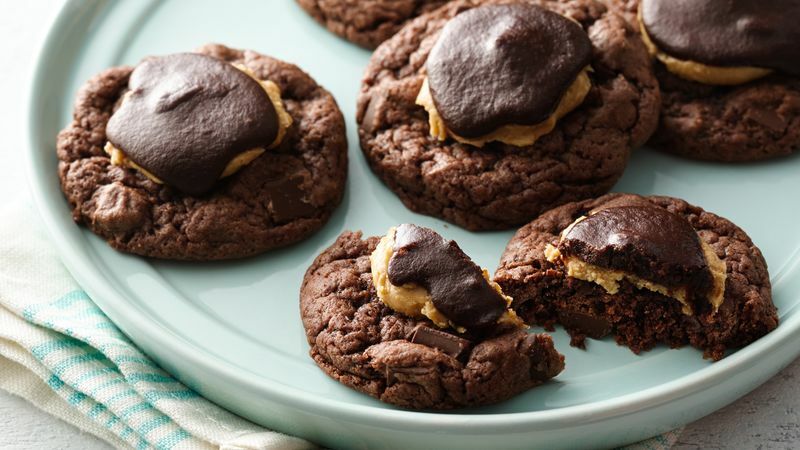 Spoon generous teaspoonful on each cookie; spread gently over peanut butter layer. Allow chocolate to set until firm, about 1 hour. Buckeye candies are peanut butter balls dipped in chocolate. The name comes from their resemblance to the nut of the buckeye tree. A trick for making drop cookies all the same size: Use a spring-handled cookie or ice cream scoop. These cookies freeze well -- store baked cookies in airtight containers with waxed paper in between layers. Bring to room temperature before eating.